What is the best way to remove spray paint off my driveway? I accidentally got spray paint on my driveway when repainting some table lamps. I used cardboard under the lamps to avoid overspray while I was spray painting, but I still got paint all over my driveway. I spray painted 7 table lamps in total. The paint color I used is pink, so it looks like someone painted 7 pink “rings” all around the driveway. The spray paint “rings” are about 5 feet across. It is a lot of paint so I believe it is going to be a big job to remove. My question is, how do I remove the spray paint from my driveway? I have tried some basic household cleaner items with no luck. Do I need to use strong industrial chemicals to remove the paint? What is the best recommended method to remove spray paint overspray? FYI, My driveway is concrete not asphalt. Try using products that are made solely to remove spray paint. The best products on the market today are called Goof Off Graffiti Remover, Wipe Out Porous Graffiti Remover, Motsenbockers Lift Off #4 Spray Paint Graffiti Remover, Sprayon Paint Remover, The Works Toilet Bowl Cleaner (not for spray paint removal but does work), or Sakrete Concrete/Mortar Dissolver. These products can all remove spray paint overspray. Try these products first and check lower on the page for a link to each product listed. If you have a very small area on your driveway or patio that needs spray paint removed, these products work well and you should consider using them. 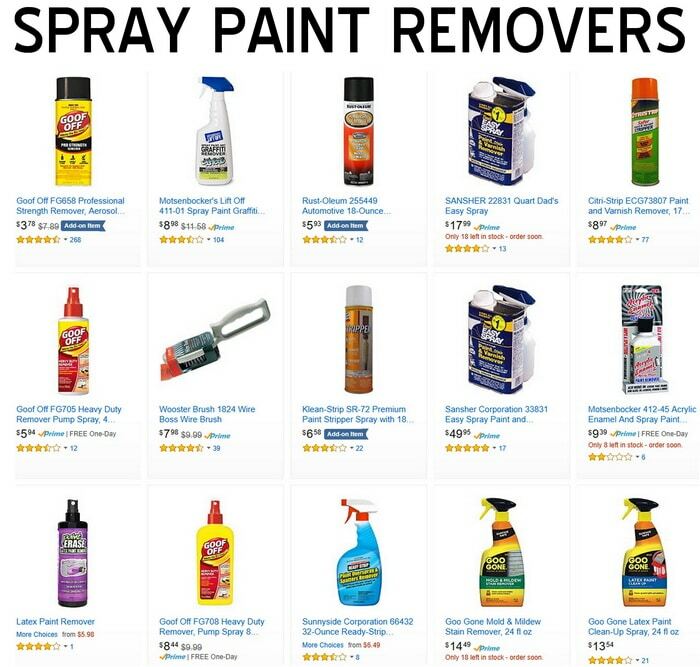 However, if you have multiple and or large areas that need spray paint removed, these products may not be enough to remove the spray paint overspray areas. If this is the case and you have many large areas on your driveway where you have spray paint overspray, try TSP (Trisodium Phosphate) which is explained below. The cheap and effective way to remove large spray paint areas from concrete is by mixing a solution made up of Trisodium Phosphate (TSP) and HOT water. TSP usually comes in powder form and can be added to hot water for an effective way to remove any spray paint on concrete or asphalt driveways and patios. TSP is considered to be a hazard. Be extremely careful when using TSP as it is potent and a little goes a long way. TSP cleaner is a very strong. 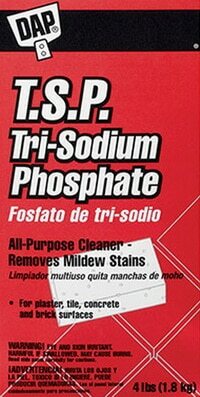 This product is a pure phosphate and must be used carefully. Use TSP responsibly by wearing rubber gloves, eye protection, and a mask so you do not breathe in any of the TSP powder. 1 – Use an empty 5 gallon bucket or similar. 2 – Use rubber gloves, eye protection, and a mask to prevent any TSP from getting into your eyes, mouth, or on your hands. 3 – Carefully mix the powdered TSP (Trisodium Phosphate) in the bucket with very HOT water. 4 – Use a heavy duty scrub brush with ultra hard bristles with a broom handle attached to it. 5 – Pour a small amount of the TSP solution on the spray paint overspray. 6 – Let the TSP sit on the spray paint you want removed for about 5 minutes to penetrate. 7 – Scrub the area vigorously using back and forth and circular motions. 8 – Repeat if necessary to completely remove the spray paint. 9 – When finished removing the spray paint, use a water hose and spray the area to remove all paint particles and TSP. Remove Spray Paint Method #3: Try using the product called Goof Off Graffiti Remover as this has shown to remove spray paint. Remove Spray Paint Method #4: Get a product called Wipe Out Porous Graffiti Remover as this will also remove spray paint. Remove Spray Paint Method #5: You can also try using The Works Toilet Bowl Cleaner as this has chemicals in it that can remove spray paint and is available at the dollar store. Remove Spray Paint Method #6: Get a product called Motsenbockers Lift Off #4 Spray Paint Graffiti Remover as this will also remove spray paint. Remove Spray Paint Method #7: Use a product called Sprayon Paint Remover as this will also remove spray paint overspray. Remove Spray Paint Method #8: Try a product called Sakrete Concrete/Mortar Dissolver as this will also remove spray paint. Remove Spray Paint Method #9: You can try using Acetone to remove spray paint from concrete, but this is a harsh chemical and should be used as last resort. Remove Spray Paint Method #10: If all else fails you can try using Muriatic acid to remove spray paint from concrete, but this is a harsh chemical and should be used as last resort. Previous post: Oven Door Is Locked – How To Unlock And Open The Oven Door? Next post: LG Front Load Washer TCL Error – How To Clear The Fault Code?